Whenever I am discussing French pastries, which is often, the first thing that comes to mind is the iconic eclair. Paté à choux (pronounced shoe), the delicate shell of the eclair, was the first kind of pastry dough I learned to make at the Tante Marie Cooking School pastry course I took many years ago. The results look dramatic, but in fact it is a very easy dough to master. With both Addison and Maddie on summer break they begged for some eclairs to welcome the beginning of a much needed vacation. Traditional eclairs are simply a choux pastry vessel filled with vanilla pastry cream and glazed with chocolate fondant. I kept to the basic variety, but used an easy chocolate glaze in place of the more temperamental chocolate fondant. I think the results are just as delicious. Melt the butter with the water and bring it to a boil. Add the flour mixture all at once and stir vigorously with a wooden spoon until the mixture forms a paste and pulls away from the sides of the pan. 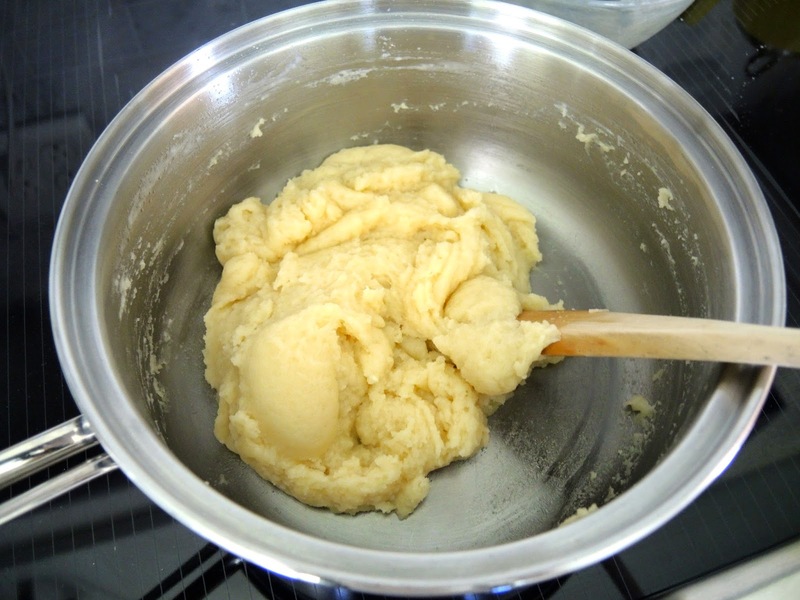 Transfer the dough to a standing mixer and add the eggs one at a time mixing well. Alternately, you can whisk the eggs in by hand with a wire whisk for a great arm work-out. 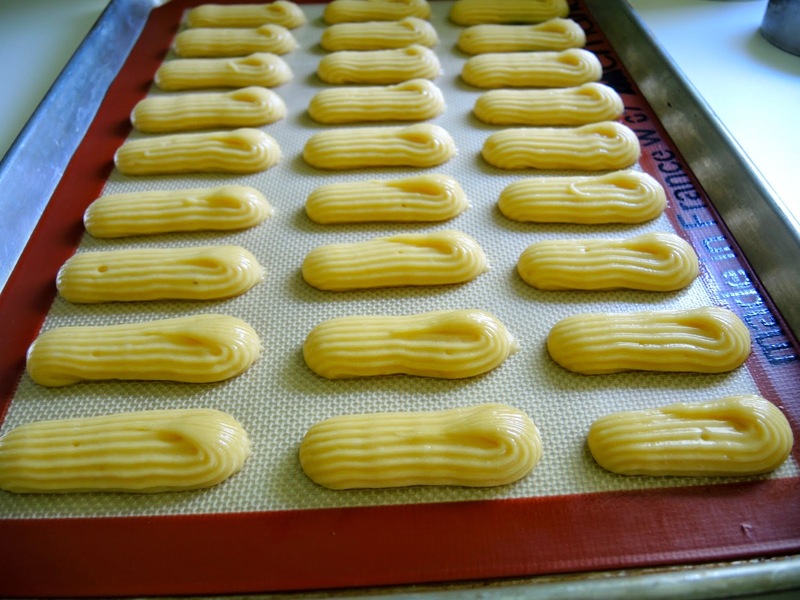 Pipe rows of eclairs keeping the length and width as uniform as possible to allow for even baking. Leave enough room between each to allow the eclairs to puff. They will double in size. Just for fun and a little texture I used a french tip instead of the traditional plain tip. 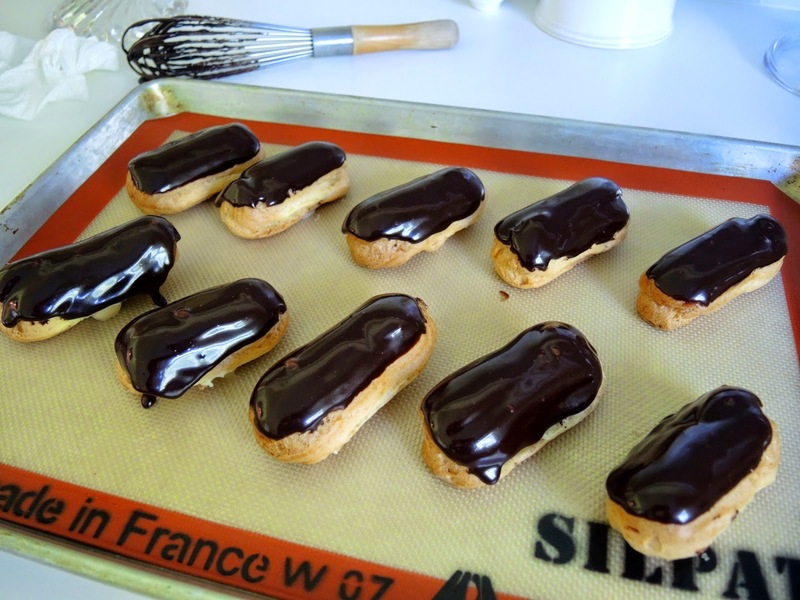 Pierce each eclair with a sharp knife in the side or the bottom to allow steam to escape while cooling. Cool the baked eclairs on a rack before filling. Preheat oven to 425℉ (220℃). Line 2 baking sheets with parchment paper or silicone baking mats. Prepare a pastry bag with a plain or french tip (#7 or #6). (Don't be concerned if you do not have the exact size tip listed, any tip will work. You will just have larger or smaller eclairs.) Stir together the flour, sugar, and salt in a small bowl. Set aside. In a medium saucepan bring the water and butter to a boil. When the butter is melted remove from the heat and add the flour mixture all at once. Then return to high heat and stir with a wooden spoon until incorporated and the dough pulls away from the sides of the pan. Put dough in the bowl of a standing mixer fitted with paddle attachment. Beat on medium speed. Add eggs one at a time beating well between each addition and scraping down the sides of the bowl. (Alternately, transfer the dough to a bowl, using a wire whisk beat in the eggs one at a time.) The dough is ready when it is smooth and holds a crease. Put the dough in the pastry bag and pipe eclairs of uniform size and width leaving enough space for them to double in size. At the end of each eclair stop squeezing the pastry bag and pull up and over the dough just piped. You can use a pastry brush moistened with water to smooth out the tail if desired. Bake one tray at a time in the center of the oven. 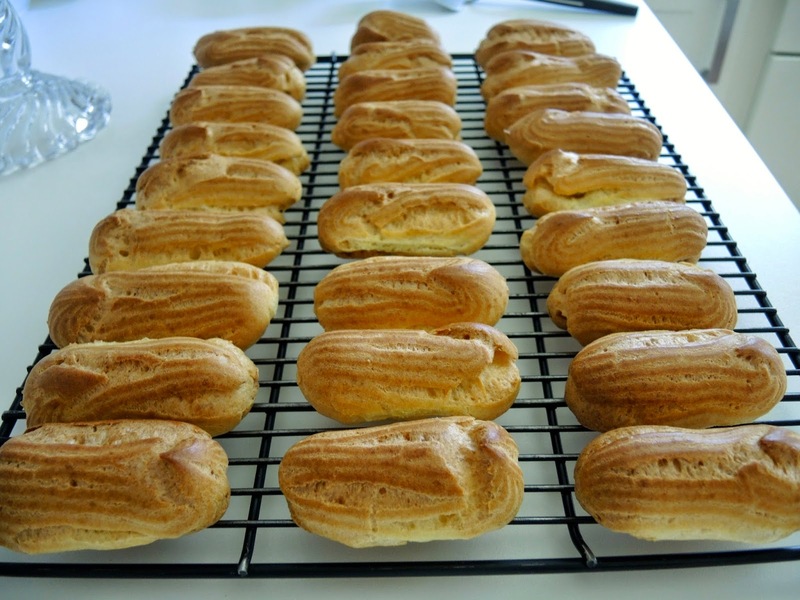 Turn the oven down to 400℉ (200℃) when the eclairs have doubled in size. Bake until golden brown, about 30-40 minutes. Transfer to a rack. Pierce the bottom of each shell with a knife to allow steam to release. Cool completely before filling with pastry cream. The shells can remain at room temperature for several hours. The texture of the fresh shell is best, but extra eclair shells can be frozen in an air-tight container for up to 2 weeks. If frozen, allow to come to room temperature then re-crisp in a warm oven. Allow to cool before filling with with pastry cream. Split the vanilla bean down the middle and scrap out the seeds. Put the seeds and the vanilla bean pod in a small saucepan with the milk, bring to a boil. Turn the heat off and let sit while preparing the next step. In a glass bowl stir together the sugar, flour, and cornstarch. Add the eggs and beat until light. Slowly add half the hot milk to the egg mixture stirring to incorporate. Return the mixture to the saucepan and whisk over medium-high heat until the center bubbles and the mixture is very thick. Remove from the heat and whisk in the butter a little at a time until completely incorporated. Stir in the vanilla extract. Pour into a clean, glass bowl. Place plastic wrap on the surface to prevent a skin. Chill until very cold at least 2 hours. Can be made 2 days ahead. Keep refrigerated until ready to fill eclairs. Combine cream and corn syrup in a saucepan. Sift sugar and cocoa together and add to the cream mixture. Stir to combine. Add the butter warm over low heat until the butter melts. Stir until the mixture is completely smooth. Remove from the heat and stir in vanilla extract. 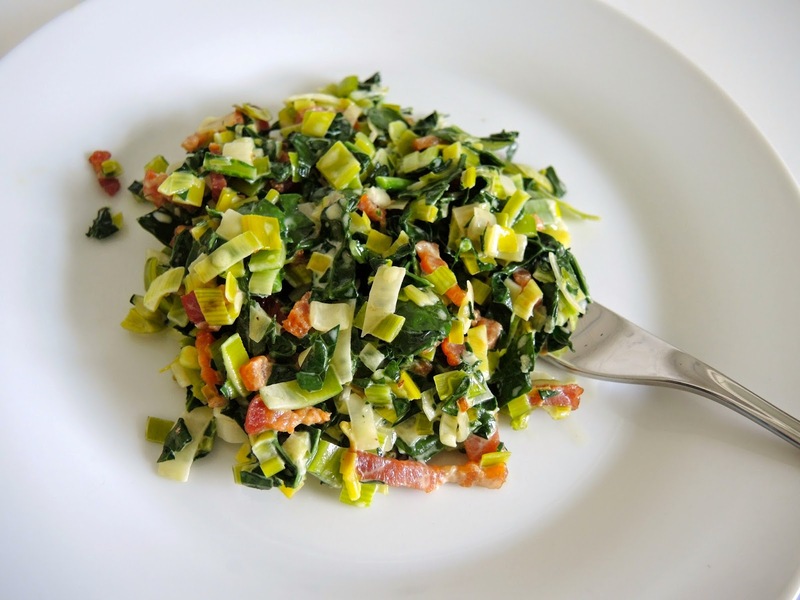 Set mixture aside until ready to use or refrigerate in a covered glass container for up to 2 weeks. 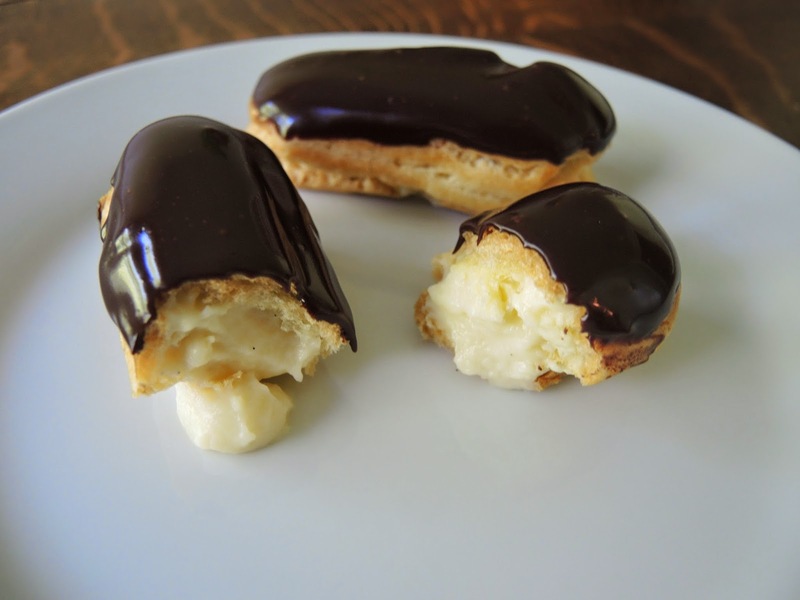 To assemble the Eclairs - Fill a pastry bag fitted with a plain #5 tip with chilled pastry cream. 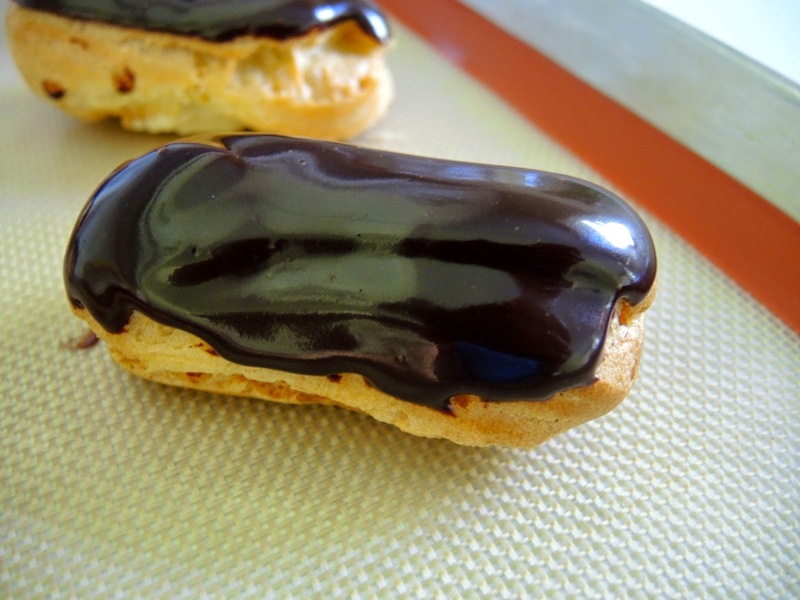 Use a smaller plain #3 tip to poke a hole in the bottom in the center of each eclair. Gently fill each eclair with pastry cream. Aim the pastry bag toward one end of the eclair and then rotate to the other side to make sure the pastry cream gets to both ends of the eclair. The eclair will feel heavy when it is full. Alternately, you can poke a hole in one end and fill. Warm the chocolate glaze slightly over low heat until it is thin enough to coat the eclair. Dip the top of the eclair in the glaze. Finished eclairs are best eaten within a few hours of assembly. Store in a covered container in the refrigerator. While at dinner with dear friends recently I ordered salmon. Normally I like to study the menu, but we were deep in lively conversation and I didn't want to be distracted even for food. So, when I took my first bite I stopped mid-sentence and added a mmm. The grilled salmon was good, but the creamy concoction it rested upon totally caught my attention. The server happened to appear at the very moment I uttered mmm. "What did you say the salmon was on a bed of" I inquired since I had skipped the details given our engaging conversation, the dim-lighting, small print, and my aging eyesight. "Creamy leeks." He enthusiastically exclaimed. "Hmm, I muttered eyes rolling back in my head checking my mental food rolodex for a salmon and leek combination. I couldn't find one. Why hadn't I thought of this before? A few days later I found myself standing in the grocery store gazing longingly at a large pile of glorious leeks just waiting to be turned into that delicious dish. Dark green kale nestled up next to the leeks. Why not? I thought. Somehow adding a little kale seemed the appropriate way to negate the calories the bacon and cream would add. And so my creamy leeks gladly married the kale et voilà a delicious side for salmon, or whatever is on your menu tonight. Slice four pieces of bacon into small pieces. 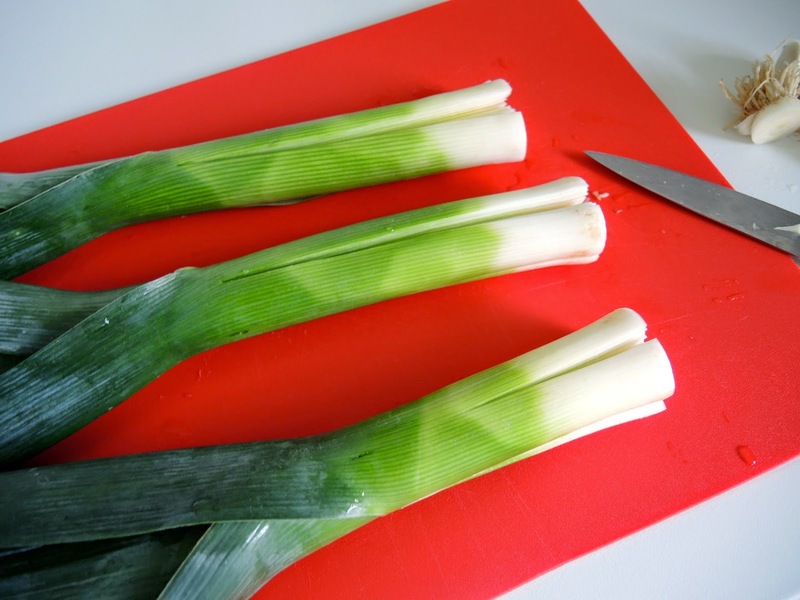 Thoroughly wash and dry the leeks to remove all traces of dirt. No one wants a bite of sand or grit with their vegetables. Cut the root end off. Make a cut down the middle of each leek up to the dark green part. 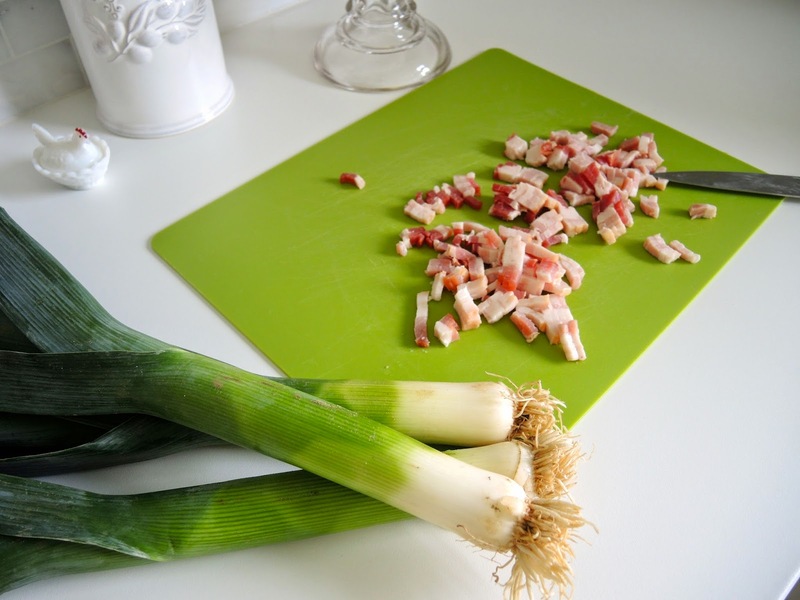 Give the each leek a quarter turn and make another cut so when you slice the leeks you have four pieces with each cut. 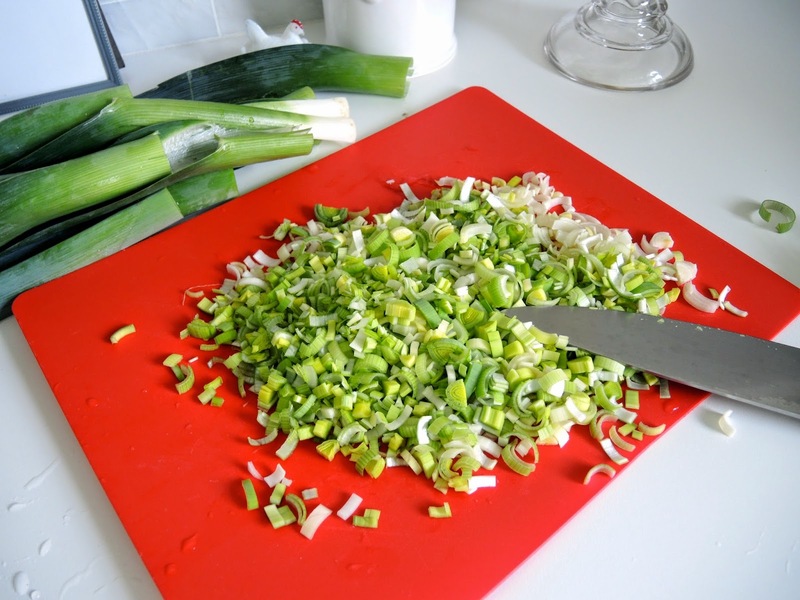 Use the white and light green parts of the leeks only. The dark green is too tough. Reserve it for making soup stock if desired. Sauté bacon until brown and crisp. Remove all but 2 tablespoons (30 ml) of bacon fat. Add the leeks and cook over low heat until the leeks are very soft about 10-15 minutes. Cover the pan to help sweat the leeks during the process. 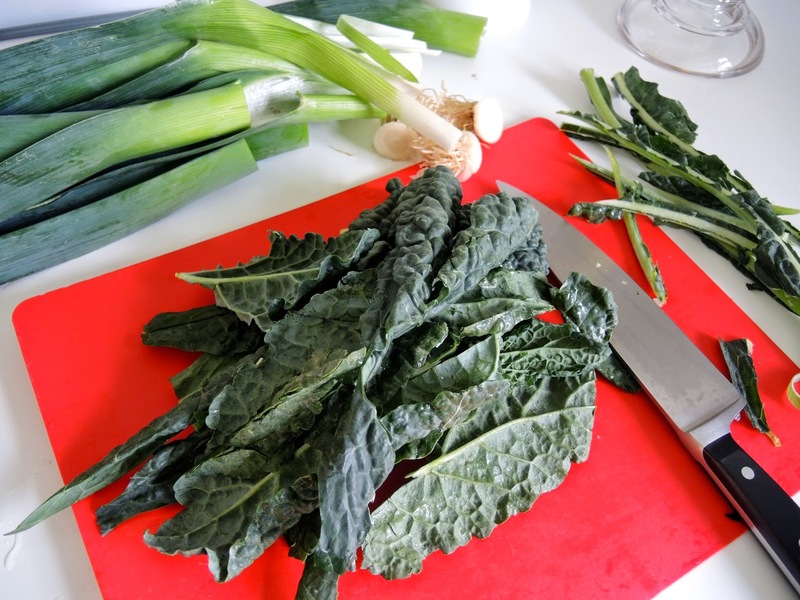 Remove the thick stalks from the middle of the kale. Rough chop into small pieces. Add to the leeks and bacon and sauté a minute or two until wilted. Add cream, salt, and pepper. 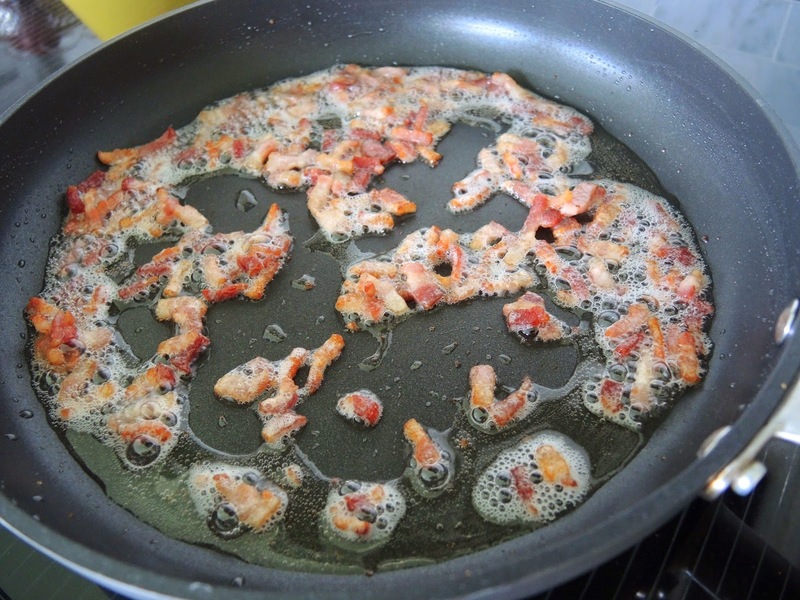 Sauté bacon in a skillet until brown. 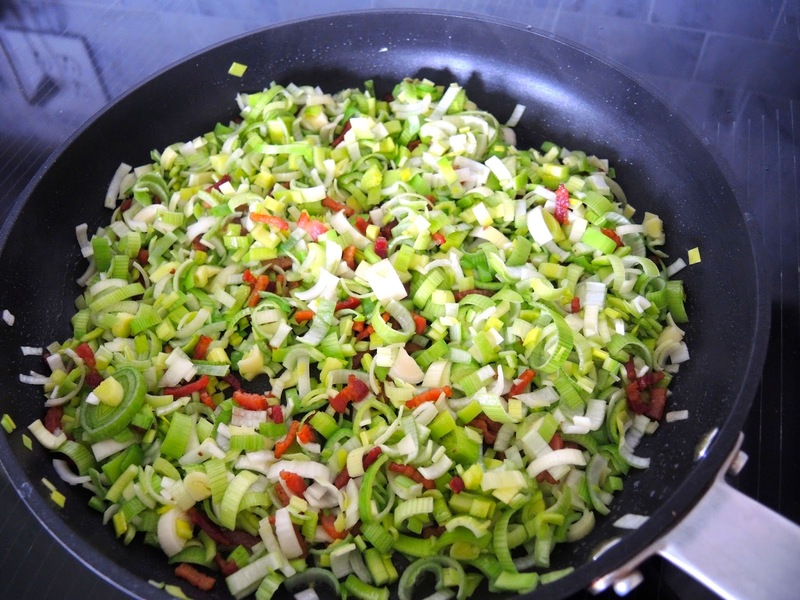 Remove all but 2 tablespoons (30 ml) of bacon fat. Add the leeks and cook on low heat for 10-15 minutes until very soft. 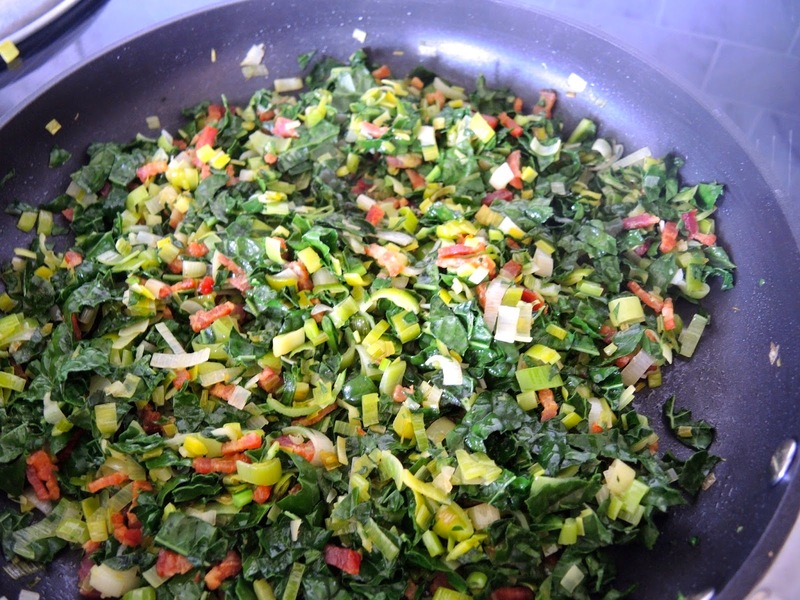 Add the kale and sauté until wilted about 1-2 minutes. Add cream, stir to combine. Season with salt and pepper. Serves 4-6. I love the happy taste combination of tangy lemon and sweet berries. Throw in a little cake and you have a party. 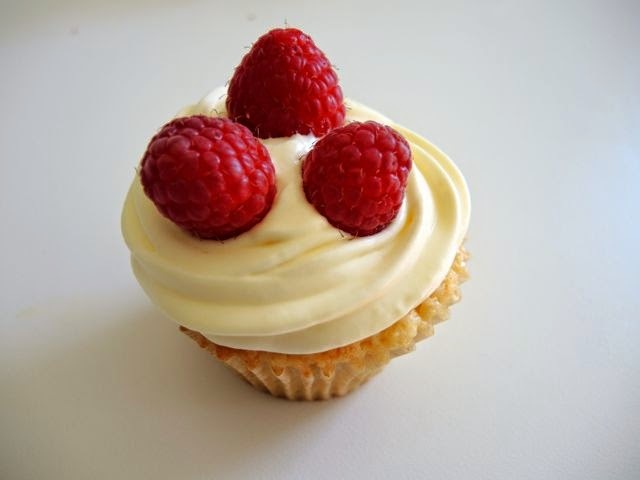 With Mother's Day on the horizon what better way to celebrate than with luscious lemon cupcakes crowned with ripe berries to honor our wonderful mothers who bring sunshine and joy to our lives. 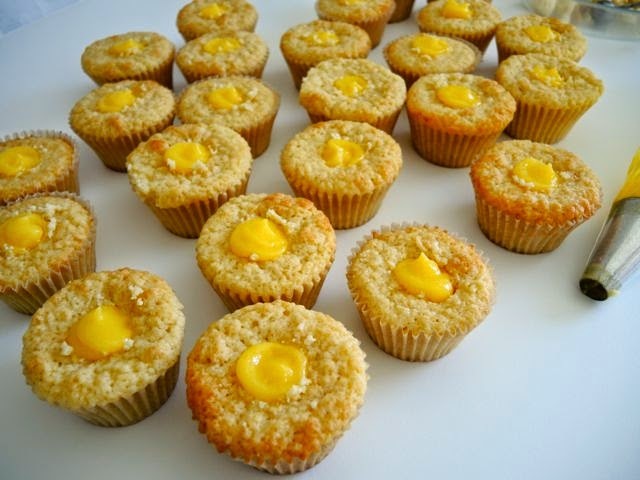 Lemon is the predominate flavor throughout starting with lemon cupcakes with a 'surprise' center of lemon curd. The cupcakes are frosted with a simple lemon mousse frosting made by folding lemon curd into stiffly beaten whipped cream. 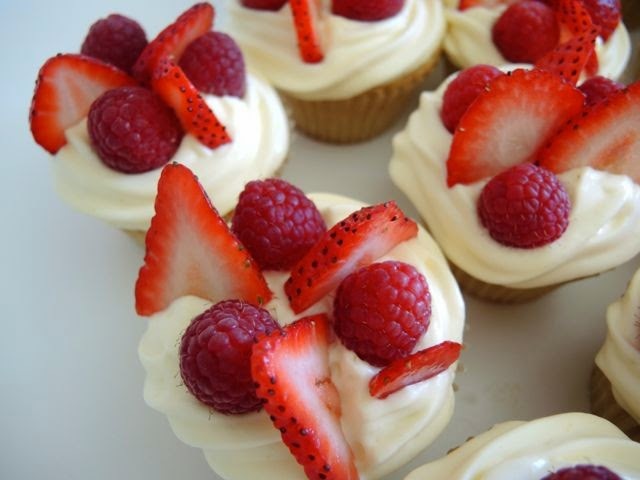 The cupcakes are delicious on their own, but adding berries elevated a humble cupcake to a pretty little dessert reminiscent of berry shortcake. 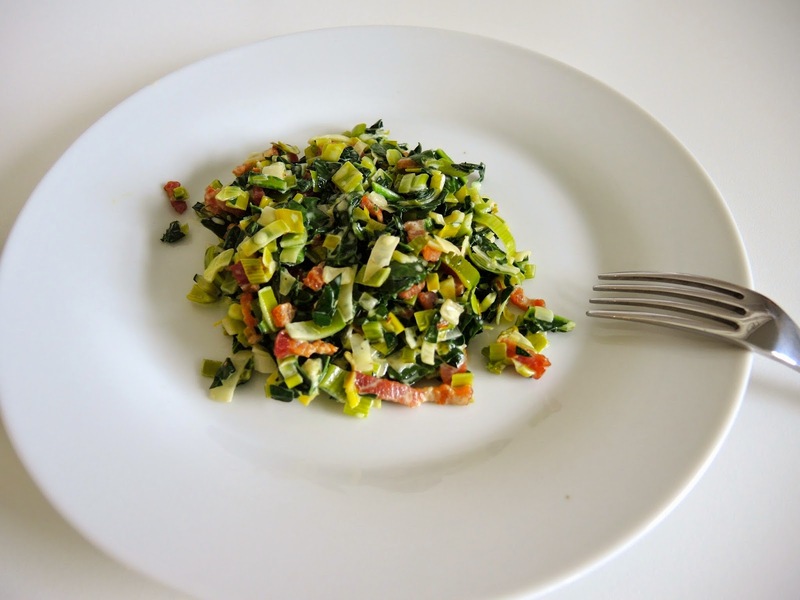 The recipe may seem long, but each part is fairly quick to make. The lemon curd and the cupcakes can be made a day ahead. Refrigerate until ready to use. I used strawberries and raspberries, but blueberries would also work well in combination or on their own. I am on a flavored-sugar kick lately. Scenting sugar with citrus zest or vanilla bean seeds gives such a flavor boost. Plus the smell is intoxicating. 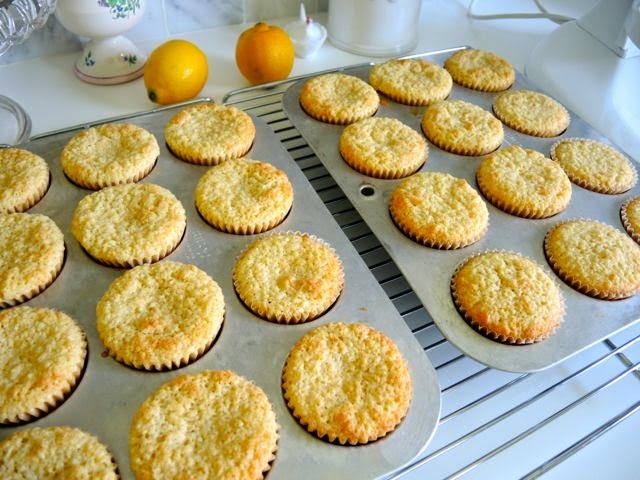 Recently, I used vanilla-scented sugar in the Easter Egg Vanilla-Scented Sugar Cookies recipe, in this recipe I flavor the sugar with lemon zest both for the cupcakes and the lemon curd. Rubbing the lemon zest with the sugar releases the oils in the zest greatly enhancing the lemon flavor. Beaten egg whites are folded into the lemon batter to lighten it. Often when you try to fold plain egg whites into another batter it is difficult because the whites break into chunks or 'boulders' as I learned at Tante Marie's Cooking School. I don't remember the science behind it but if you add some granulated sugar when beating the egg whites they stay pliable enough to be easily folded into another batter. Thus eliminating streaks of unmixed egg whites. If you chill the cupcakes first it is easier to remove the cake from the center with a melon ball scoop or small spoon. When my husband gave me a free standing Kitchen Aid mixer as an anniversary gift a friend suggested I purchase another mixing bowl. It was rather expensive and at the time I thought a bit extravagant. But it turned out to be great advice as I often use more than one mixing bowl with baking. If you bake a lot you might consider doing the same. If you don't have two mixing bowls for your standing mixer put the beaten egg whites in another bowl then wash, dry, and reuse the first bowl to make the cupcake batter. Make the lemon curd first, so it can chill while making the cupcakes. Refrigerate the lemon curd and the cupcakes in separate tightly sealed containers for up to a day ahead. The lemon mousse frosting takes just a few minutes to make. 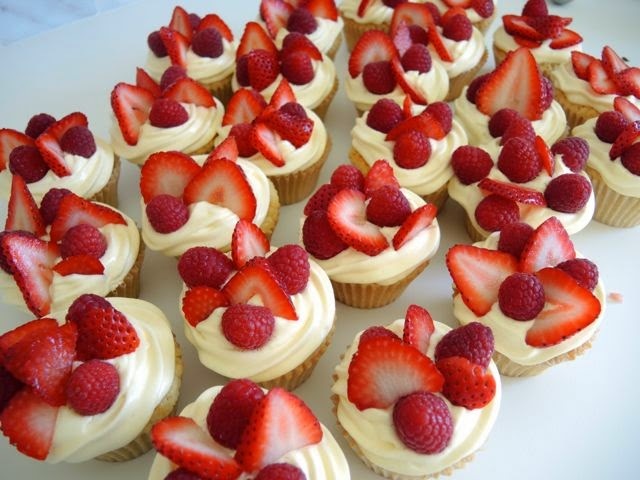 Only assemble the cupcakes a few hours before serving so the fruit stays nice. Refrigerate until ready to serve. The lemon zest is strained out of the curd before it is cooled, but it adds a deep lemon flavor. Put a fine-mesh strainer over a glass bowl large enough to hold 2 cups of lemon curd. Put the sugar and zest in a heatproof bowl. Rub the zest into the sugar using your fingertips until well combined and fragrant. 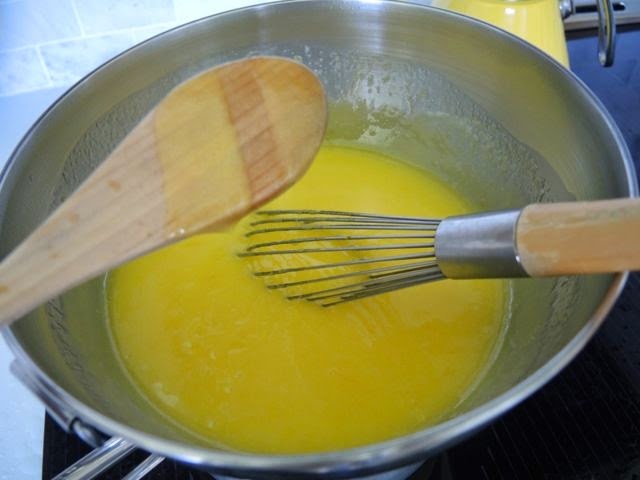 Add the eggs and egg yolks to the sugar/zest mixture and whisk to combine. Stir in the lemon juice. Cook mixture over a pan of simmering water whisking constantly until mixture is thick enough to coat the back of a spoon. Remove from the heat and whisk in the butter a little at a time until completely smooth. Strain the mixture into a glass bowl. (Straining the mixture removes the lemon zest.) Press plastic wrap onto the surface to prevent a skin from forming. Refrigerate until well chilled at least two hours. Can be made a day ahead. Preheat the oven to 350℉ (175℃). Line 24 muffin tins with paper liners. In a bowl whisk together the flour, baking soda, baking powder, and salt. In another bowl combine 3/4 cup (150 g) sugar and lemon zest. Using the tips of your fingers work the sugar and zest until mixed together and fragrant. Put butter in the mixing bowl switch to a paddle attachment and cream the butter until light about 2 minutes. Add the sugar/lemon zest mixture and beat until pale and fluffy. Add egg yolks, one at a time. Beat until incorporated scraping down the sides of the bowl a few times. Mix in lemon juice and vanilla extract. With the mixer on low speed alternate adding the flour and yogurt in three batches. Mix just until combined. Scrap down the sides of the bowl with each addition. Remove from the mixer, using a large rubber spatula stir one-third of the egg white mixture into the batter to lighten, then gently fold in the remaining egg whites. Don't over-mix. 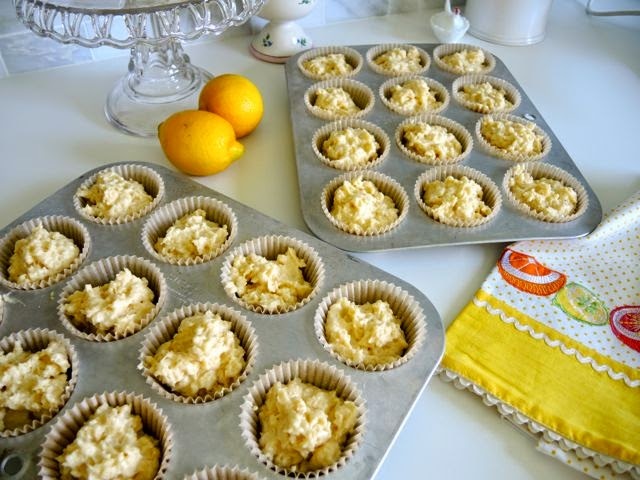 Fill each paper lined muffin tin three-quarters full. Bake until cupcakes are golden and a tester comes out clean, about 20 minutes. Cool on a wire rack for a few minutes then remove from the tins to cool completely on the rack. Cool cupcakes completely before filling and frosting. Beat the whipping cream until stiff peaks form. 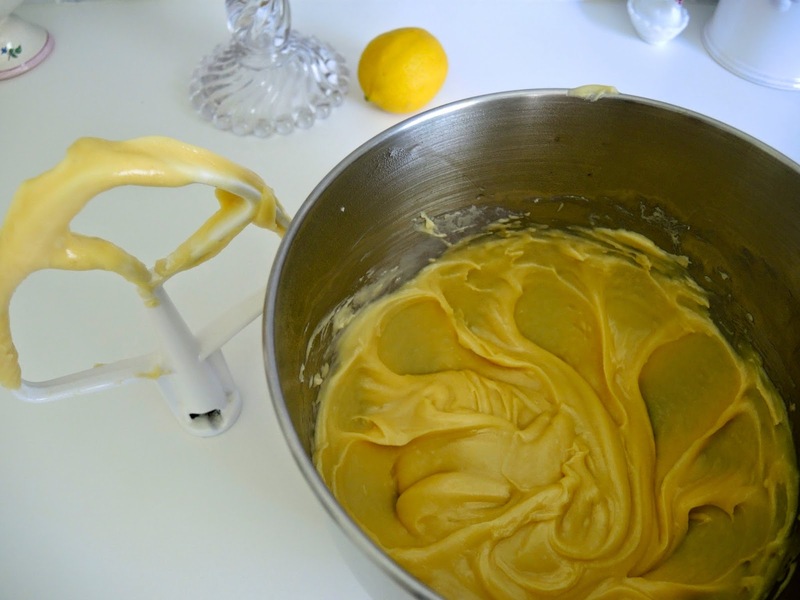 Gently fold the lemon curd into the stiff whipped cream until combined. 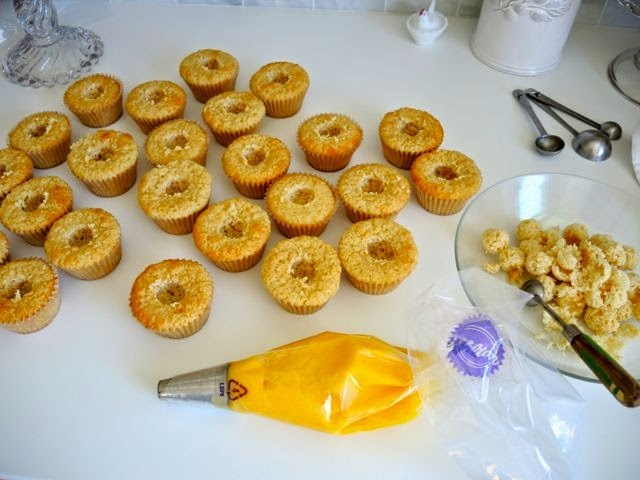 Use to frost the cupcakes with a knife or a pastry bag fitted with a star tip. If the mixture gets too soft you can beat again for a few minutes. The frosting will not be extremely stiff. It will get firmer once refrigerated. Frost each cupcake with Lemon Mousse Frosting. 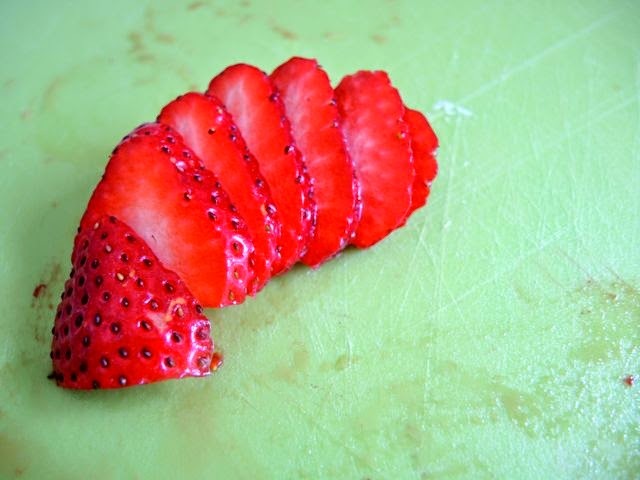 Use a knife to frost or fill a pastry bag fitted with a star tip and frost in concentric circles. 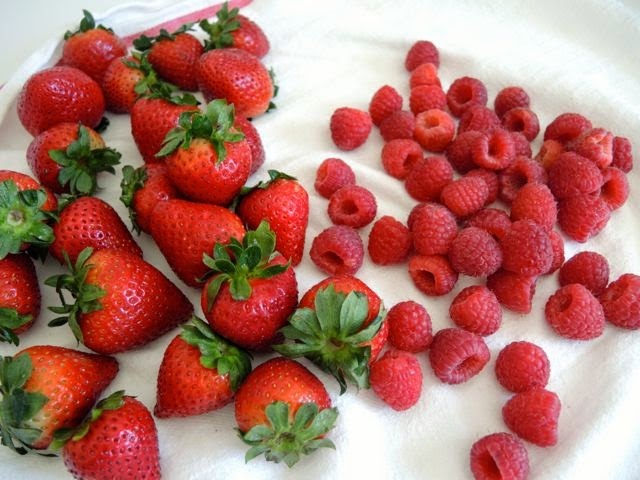 Decorate the tops with berries. The lemon curd and cupcakes can be made up to a day ahead. Fill, frost, and decorate up to two hours before serving. Refrigerate until ready to serve in a tightly covered container. Store cupcakes in the refrigerator.